Since the workshop sold out so quickly..... I have decided to do another workshop November 17th - 29th, 2015. *** Update as of January 23, 2015... this workshop is also full full. *** . If you would like be on the wait list, please email me asap. The hidden jewel and land of enchantment of Southeast Asia is Myanmar, or what many of the locals still refer to as Burma. Bordered by Thailand, India, Bangladesh, China, & Laos, this country is my favorite place on earth for photography. From the awe inspiring monasteries & temples to the simplicity of the soft spoken people, Burma stands out from the rest of Southeast Asia. It might be the least visited & explored country in that part of the world & that is what makes it so special. The hospitality of the locals make you feel like you are the first foreigners they have ever seen. It is truly a feast for the eyes in every direction and a place that will stay in your heart forever. This will be a trip for photographers who want to capture once in a lifetime images. My guide is one of the best guides in Burma and has guided many of the top photographers in the world. He is not only knoweledgable about every aspect of Burma but also highly respected and will go out of his way to please each and every one of us. We will be going to many unique locations for photography in all four of the cities that we will be visiting, often looking for monks, local villagers & children for our photos. Our trip will be about one thing and that is to be in the best light at the best time at the best locations. Photo opportunities are everywhere in Burma and we will all see why this country is the jewel of Southeast Asia. February is a great time of the year for the weather and dramatic sunsets & our focus will to be at the right place at the right time as often as possible, day and night. 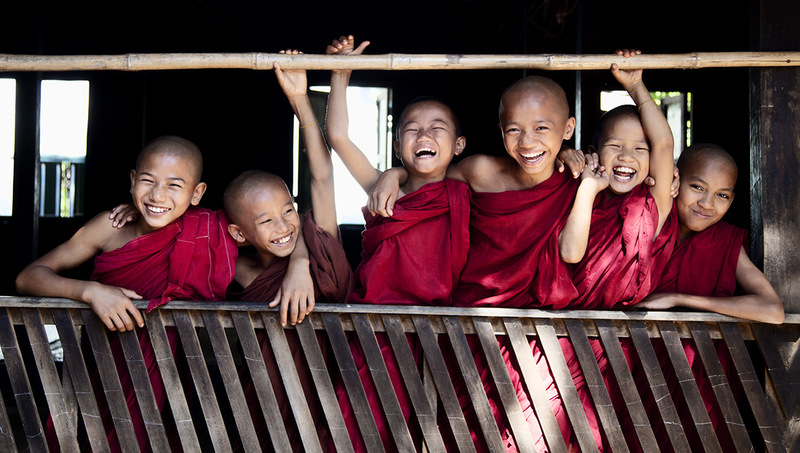 This magical place called Burma is a photographers paradise. Our itinerary includes the capital, Yangon with it’s many sights and sounds including the golden Schwedagon Pagoda and colorful early morning fish markets. We will then visit the ancient religious city of Bagan, where the landscape is filled with thousands of temples and is one of the most special places on Earth. Next is Mandalay, where we will photograph monks and local children in and around local villages and many of the amazing temples and monasteries. We will also be shooting the famous 1.2Km teak UBien Bridge at sunset, capturing monks and locals carrying their wares & goods atop their heads. In Inle Lake, we will photograph local fishermen in their traditional fishing boats, the Padaung long necked women, bustling local markets and a floating monastery. Not included: International airfare to and from Yangon, airport taxes, entry visa fees, alcohol, soft drinks, personal shopping and tips for models, monks, drivers and our guide. The workshop is limited to 8 participants. I will be working with everyone individually and as a group to better their photography skills, throughout the entire trip as I will share many ideas and techniques with everyone on creating compelling images. Please note** * We will be creating tons of beautiful images all throughout Burma that are yours to do whatever you want with. I will be creating some special compositions, involving unique set ups that you may photograph; however, you will have to agree that you will not market these particular images that I set up as your own works. Basic understanding of your camera operations including using f/stops and shutter speed is needed for this workshop. This workshop is for the intermediate to advanced photographer wanting to expand their knowledge of photography & capture one of a kind images in this special part of the world. To register for The Burma 2015 Workshop, visit my blog here for more info & please contact me for a registration form & full itinerary. For more information about reserving a space, deposits or anything else, please e-mail me anytime. The trip is $150 more than the February workshop because of the hotels going up once again. They are crazy over there. Please contact me about joining us on this special workshop.